William Dunlop joined the Temple Golf Club Yamaha team in a full-scale set-up for 2018 after riding Tim Martin's Yamaha machines last year. The Temple Golf Club Yamaha team has been left ‘numb and in shock’ following the tragic death of William Dunlop in practice at the Skerries 100 on Saturday. The 32-year-old died from his injuries following an incident during Open practice at the event in County Dublin. William Dunlop on the Temple Golf Club Yamaha R1 during practice at Skerries on Saturday. 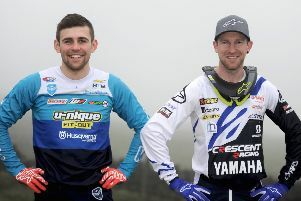 William first rode team boss Tim Martin’s Mar-Train Yamaha machines last year and this season he embarked on a full-scale effort in the rebranded Temple Golf Club outfit. After pulling out of the Isle of Man TT in June to be with his partner Janine following concerns over the couple’s unborn baby, William made his ill-fated return at Skerries. A statement from the team said: “As a team, we hoped we would never have to write a post like this. We are still numb and in shock. “William lost his life doing what he loves most but that does not make the reality any easier and we are sure that it will be of no comfort to Janine, Ella, and the Dunlop family. “We cannot even begin to imagine what the family is going through, our thoughts and prayers are of course with them all and all our team members and sponsors at this sad time. Racing went ahead at the Skerries 100 on Sunday with the Dunlop family’s blessing. The total prize fund for the meeting will go towards his family following consultation with the riders. A number of competitors decided not to race, including leading names such as Derek McGee and Burrows Engineering Racing’s Derek Sheils and Davey Todd.